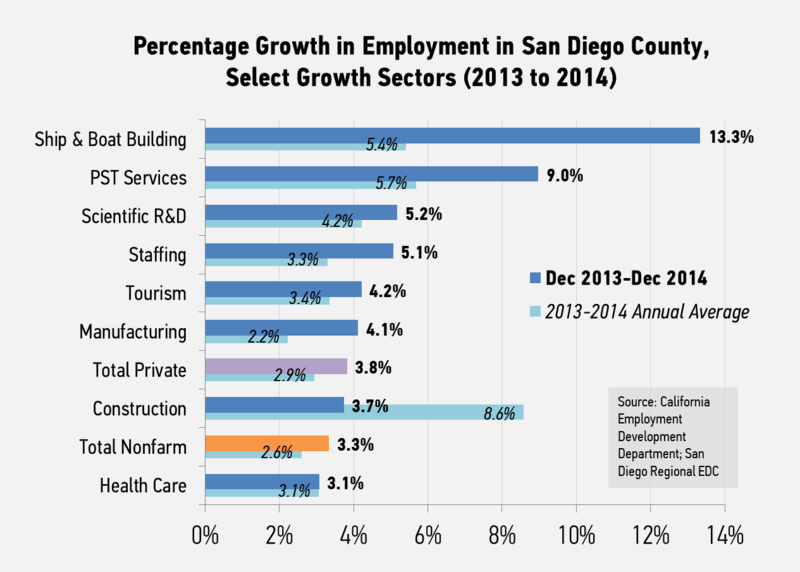 "San Diego’s economic potential was really on display in 2014. We saw our traded sectors really drive huge employment gains throughout the year, providing many good-paying jobs to the previously unemployed." The California Employment Development Department (EDD) released statewide county employment data today for the December 2014 period. 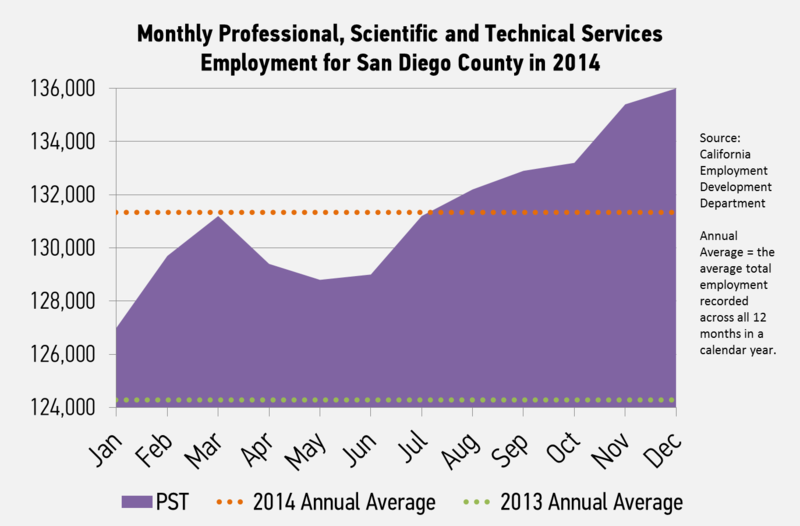 As expected, San Diego County rounded out the year with more outstanding job growth. Note that December data allows us to look at annual averages, which is simply the average of all twelve months of data in a calendar year. This allows us to make statements about total job growth from one calendar year to another, without specifying a certain month. This report will look mostly at changes from December 2013 to December 2014, as it does every month, but will also discuss annual averages where relevant. Unemployment rate will likely dominate much of the story this month, since the region experienced such a dramatic decline and finally fell back below the U.S. average. 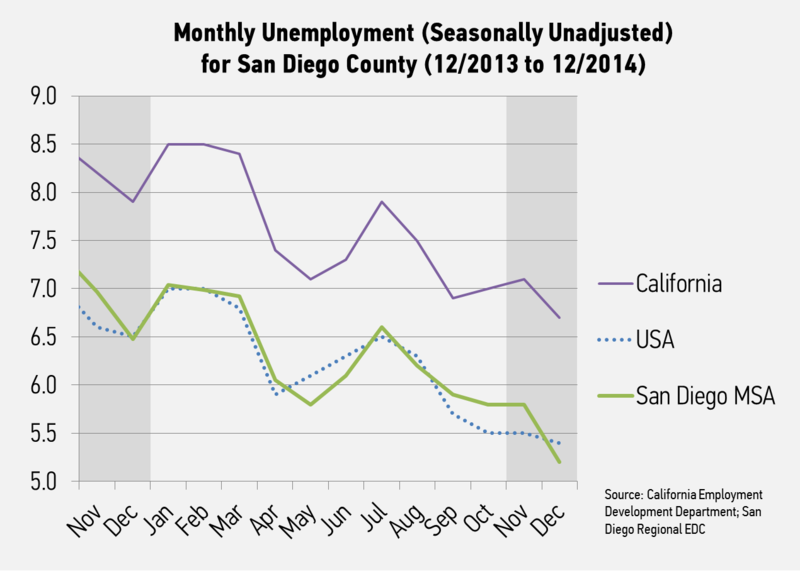 San Diego County’s unemployment rate fell to 5.2 percent in December, 0.6 points lower than November. The unemployment rate in the region was 1.5 points below California’s 6.7 percent rate and now 0.2 points below the U.S. average of 5.4 percent. While a declining unemployment rate is certainly a positive sign, the rate fell in large part because of an above average drop in the labor force. Declines in the labor force are often explained by temporary seasonal workers, retirees and students exiting the labor force. However, 16,100 less in the labor force is above average even for the November-December. This could in part be explained by the sectors where the region experienced seasonal job loss, like tourism-related sectors, construction and public education. It could also be due to a correction, since the labor force grew faster than usual in October and November. Regardless, the number is high but not too negative, since there are still 28,100 more participants than December 2013 and 19,400 less unemployed—all amid high job growth. San Diego County employers added only 600 jobs from November to December, but a total of 44,500 jobs since December 2013. This equals a job growth rate of 3.3 percent, which eclipsed the U.S. total employment growth rate over the same period. As noted in previous releases, most economists projected the region’s annual average employment to grow by roughly 2.0 to 2.5 percent from 2013 to 2014, or approximately 25,000 to 30,000 jobs. Average annual 2014 figures exceeded those estimates and grew by 2.6 percent or 34,025 jobs, with accelerated growth coming in the later months of the year—a good sign as we head into 2015. Job growth in December continued to be fueled by our private sector. 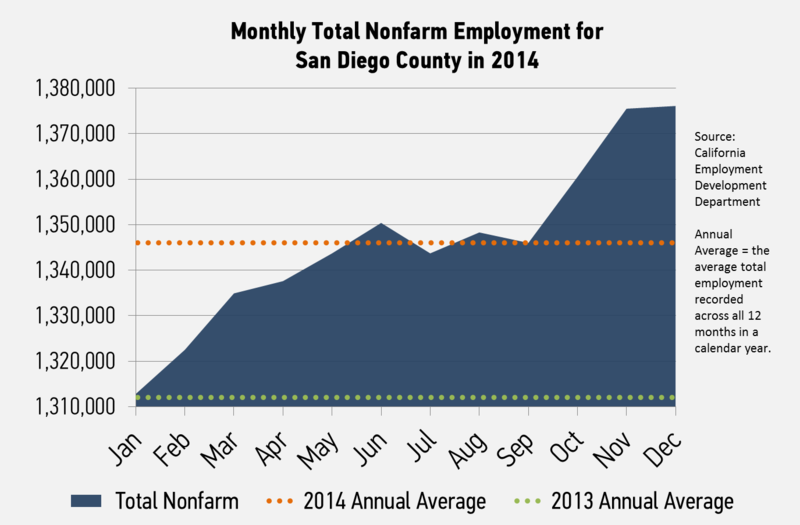 San Diego County private businesses added 1,200 jobs in December and 42,000 since December 2013. When looking at annual averages, we see that the private sector added 31,867 jobs from 2013 to 2014, a 2.9 percent growth rate. Private sector jobs accounted for 93.7 percent of average annual growth from 2013 to 2014. Construction and manufacturing industries experienced outstanding job growth in 2014. From December 2013 to December 2014, the construction industry added 2,400 jobs—a 3.7 percent growth rate. Over that same period, manufacturers added 3,900 jobs and grew by 4.1 percent. When looking at annual averages, construction was the highest growth industry and grew by 8.6 percent from 2013 to 2014. Growth in the industry slowed later in the year, but remained well-above overall employment growth. Innovation sectors continued to show high job growth. The professional, scientific and technical services (PST) sector grew by 9.0 percent from December 2013 to December 2014. This sector represents many of our innovation employers. More specifically, scientific research and development services, which represents many cleantech and life science companies, grew by 5.2 percent since last December. Both were among the highest growing industries in annual average figures as well. With December data in, we now know that 2014 was truly an outstanding year for job growth in the region. 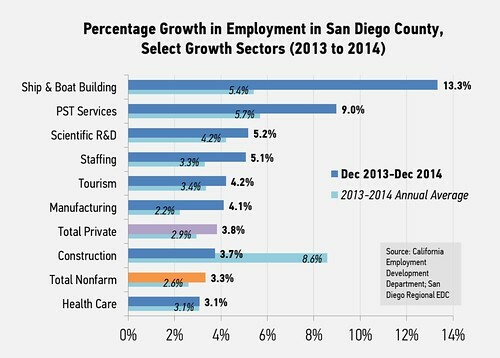 San Diego’s key traded industries led the way and the region outpaced what many anticipated at the outset of the year. When looking ahead to 2015, we see many positive signs. Year-over-year employment growth increased as the year progressed, with figures exceeding the annual average in the later months. This trend held among our key traded sectors as well, particularly in PST services and manufacturing—sectors that generally pay above average wages. We foresee many of the same possible obstacles in 2015, such as looming federal budget sequestration and rising interest rates. Regardless, San Diego enters the year on solid footing.